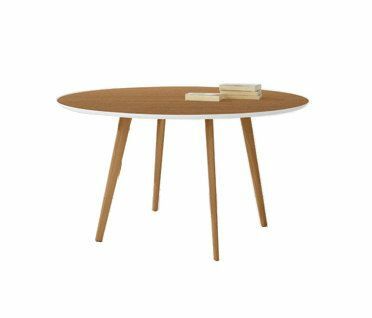 Table with white or teak-effect wood veneered round top in MDF, available in 120 cm, 134 cm o 160 cm diameter. 4 leg base h 74 with natural or bleached oak, wengé or teak-effect finishes. Gher is a system of essential and light tables, whose hardwood legs provide a warm and natural feel. The structure - available in four different colour wood finishes - attaches to the top, which is available in an array of measures and formats offering at the same time practicality of use and a refined style, for domestic or contract use. The Gher collection tables are 74 cm high and available with a round, oval, rectangular and square top. The solid natural oak legs are available in four colors: bleached oak, natural oak, wengé and teak. The white lacquered MDF top can combined with all leg finishes. A version with teak-effect wood veneered top is also available to match the legs in the same color.